Does anyone have any leads on a more reliable model "warehouse" site other than 3d ware house? The sketchup model geometry is so unreliable it's almost becoming a waste of time to visit the site in hopes of finding what you need. Seems like I have to down load 3 models before I can find one that works. I think the object doctor tool in FZ is supposed to fix these, but it never does. Even sites like form fonts has this problem. Is there such a library out there with well constructed models? Maybe FZ needs to add the project to their new years resolutions. FZ model library. Note: I'm not a programmer and don't know the ins and outs of the differences in FZ and Sketchup other than knowing Skp files are very iffy in FZ a lot of the time. - The widespread use of Sketchup means that a wide spectrum of people build and upload models - some of them may not have that much experience in 3d. - To produce models of more complicated shape there are a lot of workarounds and 3rd party plugins which again can compromise the integrity of the finished model. Some manufacturers also provide free cad files for their furniture etc. But it would be good to have a central site/place with a list of these and also a central site where people can upload/download their own models. I have had different levels of success with warehouse models - and object doctor has helped. The model doesn't have to be perfect to render, and you can usually get away with quite a lot. Another option to improve the models 'integrity' is to use a 3rd party 3d printing export from sketchup to get a solid model and import this into formZ. It would be good for someone to share their methods and experience in 'tutorials' or 'tips&tricks' of using sketchup models. Sometime ago I proposed to share models over FormZ community. Unfortunately this idea faded down due to lack of support. I myself have a bunch of various models I`d be happy to share. I guess it would be nice move from AutoDesSys to make a models repository with certain standard requirements to models and representation. Would like to see this too - the only problems I foresee is copyright issues (which may make ads reluctant to participate) - I know you make fantastic models of your own furniture ideas Anton. But, what if someone submits a model of an existing classic chair design, modelled by someone in sketchup and uploaded to warehouse, then imported and cleaned up in formZ, then added to the formZ repository? - I'm not sure of the legality of all this - I have a feeling that sketch up probably owns everything on warehouse? Sketchup, primarily, has led to the "Democratization" of 3D design, In many ways that is good, more models to choose from. In many ways it is bad, many of the modelers are not well trained and are not modeling for professional use. Furniture is very hit or miss. Stick with pro sites like Turbosquid. Models there can be cheap or very expensive but you get what you pay for and they are generally good models. Mcmaster Carr is a great site for hardware. they have thousands of free models. and the Models can be imported into FormZ as SAT files, true solid geometry. But the furniture and decor models are generall very good and cheap by any standard. There are some tricks importing into FormZ (roughness of the textures is all messed up) sometime you have to flip normals but in the end they work nicely. There are a few other that seem to have good models, It would be nice to see a list of sites people have had success with. heh heh, only by 1 min! some free some pay models. Oh! Thank`s for evaluation of my work. What I believe is: if there is a copyright issue, model`s author or AutoDesSys could just remove it from repository upon request. Also it is not a big deal to ask copyright owner if they don`t mind we use their models for design purposes. It might accelerate their sales too. Otherwise I don`t think say Artemide or Minotti allow to download their 3D models from their site. The only difference would be: models converted to FZ format. Also I don`t believe Google owns all copy rights for all models at Warehouse. Lately I have used 3D Sky for models. A fraction of the cost of Turbo Squid. Their models are pretty good and now that we have a FBX import and export there are lots of models that are available. If you don't see what you want get something close and then modify it yourself. I do this a lot with furniture. As for dealing with Sketchup models I have a lot to say about it. Here is a start. They are dirty models that are hard to work with but not impossible. I have many clients that build architectural study models and then ask me to create photorealistic presentation models from them. They think they are doing me a favor and saving time and money but they are not. Most are very hard to deal with. First and foremost is the issue of texture mapping and geometry. The models are often built by pushing, pulling and extruding faces and assigning textures to them. This will lead to a piece of geometry that has dozens of materials assigned to it and is hard to work with in Form.z. One recent model of a home had all the stone walls, wood siding and windows all attached as one object. My solution to this is to revert back to version 6.7 for the simple reason that there was a script written that was called "separate faces by color". I would love to see this script introduced into v8.5. It does exactly as it says. It then allows us to accurately texture map and manipulate faces that are of like material once they are separated. Use the Select By tool to grab all the similar materials and universally texture them. Secondly is the issue of grouped geometry even if they have similar materials. Sketchup has a lot of these. Form.z has Ungroup and Separate tools that are absolutely essential to getting these to break apart so that we can texture and manipulate the resultant geometry. As a last resort one can also download Sketchup for free and right click on any geometry. This give you the option to Explode it prior to import into Form.z. Do all of these. The main factor in our inability to work with their model is their grouping method. Once exploded you will find the model much easier to work with. Next is the issue of missing faces and bad geometry. Something that Sketchup is famous for. Obviously the first tool you look for is Object Doctor. This is often dangerous as it will fill in openings and delete geometry that you might want to keep. If you run into this it is sometimes useful to start deleting faces of objects in order to get back to the original geometry that the modeler started with. Once there you can now use the reduce mesh tool (gets rid of triangulation) and then use the extrude or reshape tools to rebuild the geometry you need. This may seem tedious but I find that it does save some time vs rebuilding from scratch. If all else fails on import I strongly suggest that you own a separate modeling program like 3DS MAX as a backup. It is expensive but so is my time. It imports almost anything and allows you to explode and clean up models in ways that other programs can not. If however the model doesn't come into MAX clean then you need to throw it away. It is trash. Last piece of advice is to know when to cut your losses. 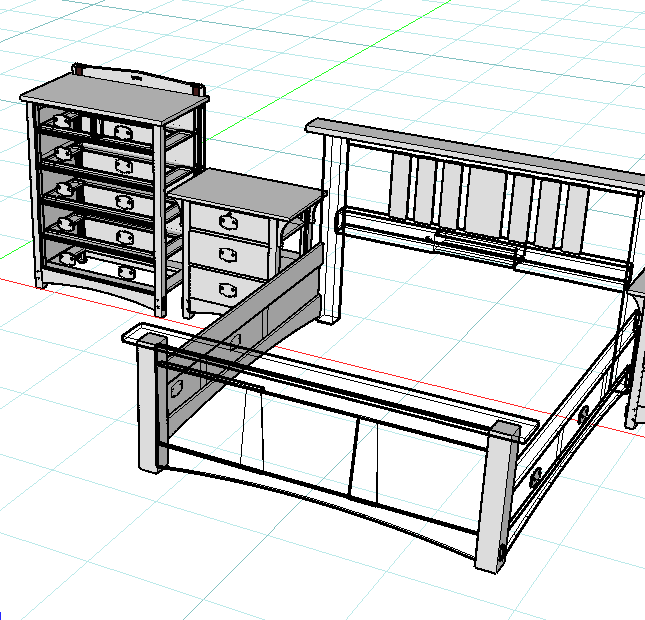 Many hours have been wasted trying to fix Sketchup models rather than just rebuilding from scratch. I am often asked to bid a project and told that the model is complete and all I need to do is texture map, light it and press render. If only that were so simple. Many of the models I work with look fine on inspection but quickly fall apart as I try to work with them. It is essential to know when to quit using their model and start over. Often pieces of their model are useful. I will put these on a separate layer (named garbage) so that I know what is mine and what is theirs. If a problem arises in the process I look there first. I have written here many times about the trend in modeling ( at least in my business). Most of my clients now design in 3D using Sketchup or Revit and then send me their models rather than elevations and plans which was the case in the past. Form.z must adapt to this change by creating the most robust import and export tools possible. Flexibility between platforms might be the hardest thing to achieve in this business. A constant rolling target as they all evolve separately. Yes, often times geometry from the 3D Warehouse can be bad, but it is not too difficult to find models that were built in programs other than SketchUp that have decent geometry. The key is to analyze the geometry, and not use (and especially not make many copies of) objects that are junk. We have had a number of requests in the past for us to host models in FMZ format that can be shared by our users. We have said that we will seriously look into offering this option if enough users post models that they would like to share. (Setting up such a site is not a trivial task by any means and we want to make sure that we are focusing our resources to best benefit our community.) So far, Anton has been the only one (that we remember) who posted models (thanks Anton!) but we need significantly more models to justify the required time to complete such a task. 1. Yes, Separate Faces by Color was a nice feature and we will see if this can be added to v8 in the near future. 2. When running the Object Doctor, first use the Add to Selection option, and Dispaly Results. This will show you all the problems. Use this on specific objects (ie, each piece of furniture, car, person, etc) rather than running it on an entire library of parts. This way you can see more directly what you are dealing with, and better decide if that part is worth using or not. 3. Run the Object Doctor again with the Fix option. When doing this, also uncheck the Missing Faces option (unless you specifically have missing faces you want to repair) and you will avoid the "covering unwanted faces" problem that Andrew mentions. 4. Once you have Fixed the Geometry, the Results that are shown ONLY show what was fixed. If the Fix results all = 0, that does not mean there are any problems, it only means that nothing was fixed. Run the Dr again with the Add to Selection option once more to see what problems still exist. 5. The UnMesh tool (also achieved via the Fix Coplanar Faces option of the Object Doctor) is a safe, easy fix for eliminating unnecessary geometry in a project, but the Reduce Mesh tool is not -- at least not always. We actually removed this tool with the v7 upgrade because while it will reduce geometry, it will (by its nature) also create nonplanar faces, which are not well defined. Triangulating these nonplanar faces will restore their planarity, but doing so may add as much geometry as was removed by the Reduce Mesh tool in the first place, and the results may not be as clean. If you use this tool, carefully inspect the results and make sure that what you have is an improvement in terms of the number of polygons (in relation to the original number), as well as the quality of its geometry. 6. Know when to cut your losses: Yes, if geometry is garbage, then you should either use what you have as a template to quickly rebuild better geometry, or download a different file and see if you can find a file with better results. 7. We are doing our best to find cases where bad SketchUp geometry causes a problem in formZ, and wherever possible, we are adjusting our software to better handle this. Bad geometry will generally never Boolean properly (so don't expect that -- or the Reshape which is a "live Boolean" behind the scenes), and while it may create a bad "local display issue" it should not cause the entire screen to display poorly, or othere such problems. If you ever encounter such an issue, if you can send the part of the file that is causing the problem, we will investigate this and see what we can do to make formZ more "bullet proof" (or garbage proof) for the future. 8. Generally importing files from Revit should work fine (unless they were first built in SketchUp and then imported into Revit). As Andrew notes, SketchUp is notorious for creating bad geometry, and if you look on their forums, their users are repeatedly encountering this problem, and as such, they are searching for new programs to use that do not have this limitation. Fortunately for us, we have been able to convert a lot of these users to formZ users so they can build models that can be utilized throughout the entire design, and construction process. We hope this helps, and if you have a quantity of decent models that would be useful to others that you would like to share, please zip and send them to support@formz.com. (You can also make a post in Tutorials by Users and give a link to these files there if you want to share them with others.) If we do receive a significant quantity of quality models that would justify the creation of a site to host these, we will certainly consider this. Thanks for the clarification on this subject. Concerning Revit models my architecture clients sometimes send me these with all the library parts linked into the main file. These include everything from toilets, faucets, window hardware, etc. None of which I need. These files are huge and very difficult to import. One must ask the client to remove all linked library parts prior to export or you are in for trouble. Concerning the formation of a model library I have thousands of models I could share. One concern I have is the copy right issue. Can I submit a model of a home that was designed by an architect without asking their permission? I doubt it. My contract stipulates that the image can only be used for the promotion of my business and I am sure that extends to the model itself. I also have hundreds of pieces of furniture that are Frankensteined together from pieces of other furniture. Some of it I made and some came from outside sources. How much of a model needs to be original before it is considered copy right free? I would hate to get in trouble by making assumptions on this. Since we are on the subject, can anyone convert a 3DS model of Hogwarts Castle to .fmz? Converting it should be easy. Is there a reason you can't import it into Form.z? Seldom do much importing, I see it now. Thanks for bringing this to my attention. These files have a .max extension and are grayed out in the import dialog. For .max files you need to have 3dmax installed before you can translate to another format. You could post your files here and ask for someone with 3dmax to convert.....or go to the Autodesk site and download a 30 day (fully working with no restrictions) trial. If anyone can convert to .fmz please let me know here. I think it would be good to have an Autodessys maintained depository, however there can be a lot of time and expertise [not just modelling expertise] involved in producing a good model, and to let that become available for free is insufficient incentive to those who have put in the hard work. But who will check the model thoroughly to ensure it meets standards? I think it needs to be 2 tier, free and paid for models, but would there be sufficient sales to be workable. Maybe not, because there are probably not enough FZ users, though now that there is a free version, with the right kind of publicity and if FZ continues to improve, especially repairing little bugs, and introducing a few missing features, it could be something which could happen in the future if FZ gains market share rapidly. First the product needs to be rock solidly stable and without gaps in features, then a big publicity drive, The future of FormZ and a FormZ warehouse could be bright if Autodessys is determined enough imho. Yes agree. Nothing could be more difficult! Ok, great -- are we correct that you are volunteering to help get the ball rolling, and add content submitted by other users (and check the models for quality -- and handle any copyright issues)? If so, thank you very much. If "you" (the formZ users in general) are able to demonstrate that there is sufficient interest, and that users are indeed willing to post files -- rather than simply wanting to download them, then this can be a great start. If there is enough interest and a "critical mass" of projects can be reached to demonstrate the viability of such a site, we could then "take it over" if you no longer wish to maintain the site on a longer term basis. Or, if as some users have suggested this can be taken to the next level and some models can be for purchase (and you want to handle that aspect), then feel free to claim a percentage as your fee for your efforts.